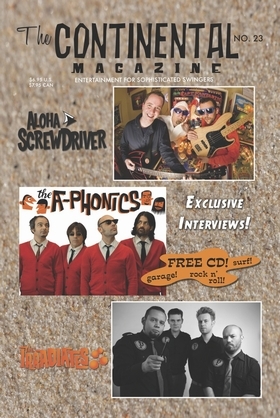 Exclusive interviews with some bright new faces on the surf/instro scene: Aloha Screwdriver, Els A-Phonics and The Irradiates. All three bands have released outstanding new discs in the last year or so, and amazed and astounded instro fiends all over the world. We also ask some of your favorite surf/garage rock stars what their favorite non-surf/garage rock discs are, plus there's tons of music and DVD reviews, including more vinyl reviews than ever before. You also get a free 20-song CD filled with lots of great surf, instro and garage rock tunes. A5 digest size, 40 pages in all, with a full color glossy cover.